Print VDA label - For free! The VDA 4902 label contains various information as plain text and Code 39 barcode. The barcodes are signed with an identifier so that automatic processing of the VDA data by scanning all barcodes is possible. The VDA 4902 standard has been revised by the German Association of the Automotive Industry - VDA the last time in 2012. 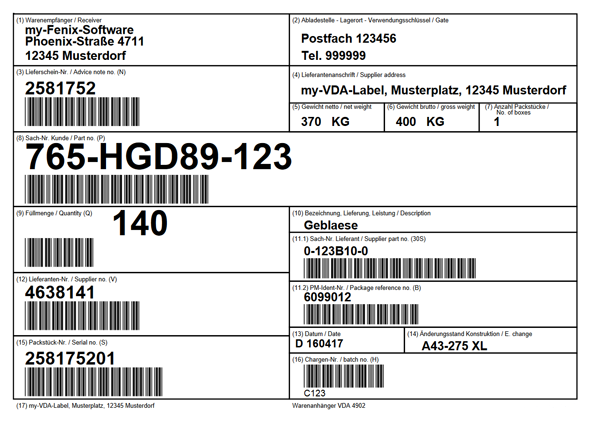 In 2012, the VDA 4902 standard was extended by a definition for printing a 2D barcode (Datamatrix Code) on the VDA 4902 label. The basic definition comes from the years 1994 and 1996. Meanwhile, the definition has been replaced by the VDA 4994 standard. Nevertheless, the VDA 4902 standard is still very widespread and is used in almost every company in the automotive industry and its suppliers. The standard VDA 4994 defined by the German Association of the Automotive Industry describes a label for the identification of transport packaging in the internal material flow of a company or on the transport route between consignor, freight forwarder and consignee of goods. VDA 4994 labels provide a unique identification of packets worldwide. It contains machine-readable data as 1D barcode (code 128) and 2D barcode (datamatrix code). The VDA 4994 - Global Transport Label Standard replaces the obsolete definition of the VDA 4902 transport label since 2016. The standard VDA 4992 defined by the German Association of the Automotive Industry describes a label for the identification of packaging or material in the material flow of a supply chain. 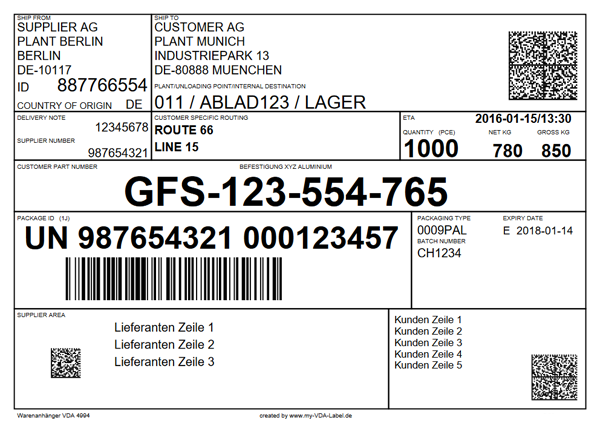 VDA 4992 labels provide a unique identification of packets or material. It contains machine-readable data as 2D barcode (datamatrix code).